When you practice Pilates alongside your golf practice it can help decrease your chances of injury and improve sports performance. Being able to properly swing a club and also have the necessary range of motion, strength and neuromuscular control to allow your body to execute the swing is the key to a successful golfing experience. The spine is subject to a very rapid and complex loading pattern. In less than a couple of seconds, the spine and extremities are taken to their end ranges of motion, making the extensibility of soft tissues dictate the path of the swing. Lacking flexibility in the mid-back and hips may cause the lumbar spine to bend and rotate in ways that increase spinal stress. The golf swing also involves a combination of non-functional movement patterns and rotational movements around multiple axes. Since these are not typical motions, i.e. 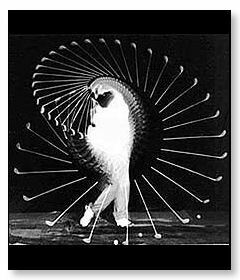 the head moves opposite the body through most of the swing, there are different neuromuscular firing patterns that must occur. Individuals may be prone to upper body injuries if they don’t possess the strength to control their flexibility in these atypical positions. Regardless of age, gender, or experience, muscle strength and flexibility imbalances can impair one’s ability to play effectively. Optimal spinal mobility at all levels is critical since limitations at one area will increase compressional forces on another. This is particularly important during the end ranges of the swing when control of the upper back and rotation need to be maximal. The pelvis should also stay relatively still and in neutral throughout the swing to allow the body to rotate around a neutral spine axis. Good hip range of motion, particularly hip internal rotation and hip extension, is very important. A tight iliotibial band combined with weak hip abductors can be a culprit for many swing faults. What is often overlooked is the importance of also working on hip and lower extremity control in weight-bearing positions. Integrating postural exercises is necessary for any sport, but with golf, the added complexity of the head moving in an opposite direction of the arms and thoracic spine makes it critical. Also, the potential for repetitive upper extremity injuries exists if the golfer doesn’t have good scapular control.